Robert Engelbart, 79, of Leigh, died Saturday, November 26, 2016, at St. Francis Hospital in West Point. Funeral Service Wednesday, November 30, 2016 10:30 A.M.
Robert was born July 9, 1937 in Platte County to Reinhold and Martha (Loseke) Engelbart. He attended grade school at District 43, graduated from Leigh Public School in 1955, and was active in the National Guard for 8 years. Robert married Loretta Stepan on September 30, 1961 at the New Zion Presbyterian Church in Clarkson, Nebraska .Robert worked at the Leigh Farmers Co-op for 37 1/2 years and retired in 1999. He was a member of the Leigh Fire Department since 1962. Member of St. John's Lutheran Church in Leigh, Leigh FFA Alumni and Community Club. Has served on the church council, Village Library and Tri County boards. 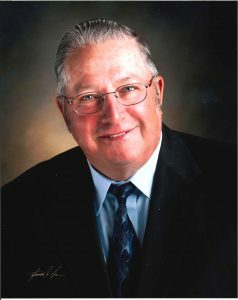 He was also a member of Blue Birds Across Nebraska, enjoyed woodworking, fishing, hunting and farming. He enjoyed nature and helped build and monitor bluebird houses in the Leigh area. Robert loved to watch and feed the birds and squirrels. He enjoyed watching Husker football and volleyball and spending time with family and their many friends. Survivors include his wife Loretta, of Leigh, two sons and their wives, Russell and Tina Engelbart of Norfolk, Roger and Lynn Engelbart of Malcolm, eight grandchildren, Whitney, Jarrett, Amanda, Casey, Dalton Engelbart, Kristina (Greg) Troyer, Daniel (Stacy) Saltzman, and Rebecca (Anthony) Aden, great grandchildren Anthony and Parker Aden, Ambrea, Avery and Adalyn Troyer, Dawson Saltzman and a sister Fern ( Norbert) Theilen and brother-in-law Dennis Zoubek. He was preceded in death by his parents and sisters Marcella Theilen, Luella Zoubek, Ilene Theilen and Irene Hansen, and one great grandchild Dylan Aden.